Before there were Geth and Darkspawn, there were Jade Empire's Lotus Assassins, and BioWare's co-founders hope there will be again. BioWare founders Greg Zeschuk and Ray Muzyka say that the Jade Empire franchise isn't out for the count, and that while the studio isn't working on anything Jade Empire-related at the moment, they'd both like to see new games set in the world. Released in 2005, Jade Empire was a rather large departure from BioWare's usual faire, not to mention Western RPGS in general. The game took Chinese wuxia stories and elements from Asian myths and legends, and blended them together into a then Xbox-exclusive action RPG. The game was later ported to PC in 2007 and to the Mac in 2008. Unlike other BioWare franchises, such as Dragon Age or Mass Effect, Jade Empire has never received a sequel. However, that doesn't mean that BioWare has forgotten about it, and Muzkya and Zeschuk said that they'd been thinking about how to bring it back. "We're just looking for the right way to deploy it," Muzkya explained. "We have a lot of different projects now on a lot of different platforms, and you might see some [Jade Empire] in the future. You never know." "It is a franchise that's near and dear to us," he added. 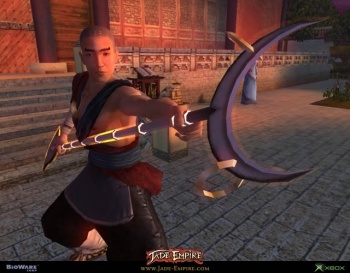 Even though, realistically, the next time we see Jade Empire will probably be as part of a Facebook game or something similar, I've still got my fingers crossed for a full sequel. BioWare has gained a lot more experience with action-based gameplay since 2005, and another Jade Empire game would add some spice to the RPG landscape. Who knows? If this hypothetical RPG sells well, it might even inspire other developer to branch out a little too.